The 4x2 DVI Switcher provides you with greater flexibility in integrating cross platform computer equipment easily without networking. It enables you to switch easily and reliably between any combination of four DVI (digital visual interface) computers using two DVI displays which will project the same image on both monitors at all times. The dual-video solution simply acts as a 2-port video splitter within this DVI KVM switch solution. Since the 4x2 DVI Switcher offers two DVI outputs, you could conceivably work on one of four computers using two displays at the same time. 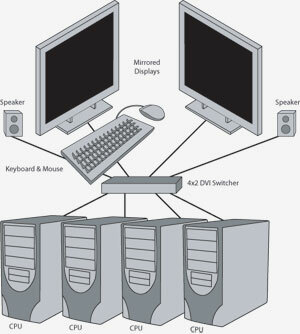 Audio is switched for each computer as well, allowing for the creation of multimedia desktop environments, and you can even choose between a Macintosh or PC keyboard/video/mouse combination. Simply plug your display, keyboard/mouse and audio peripherals directly into the 4x2 DVI Switcher's outputs and connect the supplied cables to the four computers you want to control. You then select the computer you want to work on using remote that comes with the unit. Switching between computers is done from the 4x2 DVI Switcher remotely using the ex•tend•it infrared RMT-4IR remote control, or the wired RMT-4 remote.